It's the Little Things. . .: A Busy Week . . .
A Busy Week . . .
First, I want to wish a belated "Happy Anniversary" to my big sis and her hubby of 42 years!!! Congratulations and I love you both!!! It’s been a busy week around here . . . what with my mom coming in from Michigan, driving up north to my sister’s house to celebrate her birthday on Friday, an open house wedding reception for my nephew and his bride on Saturday, and back home on Sunday. Mom is spending the week with my sister and will be back sometime this weekend! For now, it’s “pedal to the metal” time as I work to get this week's customer quilts completed before Mom comes back to my house. So far I’ve quilted four quilts and have at least three more to get done before Sunday! Sun Porch Throw - This customer didn't piece her quilt top; instead she brought me two pieces of decorator fabric that she wanted quilted together. 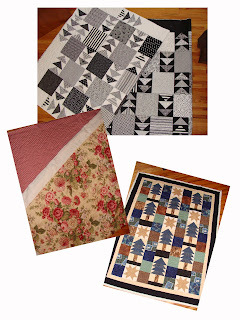 Flannel Trees - This customer is donating this cozy throw for a raffle to benefit rescued husky dogs. Over the past few weeks I've been working on some "thrifty" home decor projects. I needed a "table" next to one of our recliners in the living room so I thought I could stack to baskets together. It didn't look so good . . . So I decided to paint the top one white . . .yuk . . . you can still see those raised apples! I managed to hide those under a little bit of green grosgrain ribbon! But then the top of the basket wasn't strong enough . . . or flat enough . . . to accommodate a beverage glass, so . . . I took a frame I picked up on clearance at Joann's for $2.50 and inserted a piece of 12x12 scrapbook paper. However, the paper wasn't quite big enough for the 11 x 14 frame so I just laid a couple of pieces of green grosgrain ribbon (from the basket project) at the ends! And - Ta-Da! Not too shabby . . . or should I say ... "shabby chic"? I also found that I love the look of this plate display that I found on "The Nester's" blog . . . So, I found some plates at a couple of thrift stores and the clearance section of TJ Maxx. Oh - but wait -- I needed the plate hangers -- those were $3.00 each so that's another $27.00! Nearly $11 more than the plates themselves! But, what a great wall display I have for less than $50.00!!! I'm happy! There's lots more to share but I'll have to save that for later ! Thanks for the anniversary wishes - love your plate display! Great idea on the baskets too! The creativity is just spilling out all over the place. I like the plate display....may have to borrow that one! Big neighborhood sales tomorow...hoping I score some good finds. Ok Suz, what did you say that they had to remove your comment? Look what's for dinner tonight!!!!! I LOVE White Ceramic Ware!